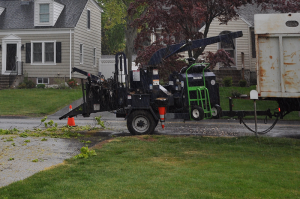 Ideally, tree removal is something that is planned for in advance, and regular tree screenings allow you to determine which trees on your property need to be cut down before they die or become weakened enough to pose a hazard. However, there are times when this isn’t possible, and emergency tree removal needs to be performed. This can be the result of severe weather that critically damages a tree and structurally compromises it; some of the hurricanes that have made it up to New England in past years have left many trees in such a state. Some emergency removals require lifting trees that have already fallen on top of structures; others deal with trees or branches that have been weakened to the point where they may fall at any moment. Precision Cutting Services is available to do emergency assessments and removals at a moment’s notice; in such cases, we do everything we can to dispatch a removal crew on site immediately. If no crew is available at the time, we will work with you to schedule a pick-up visit as soon as possible. If you need emergency tree removal services, call us right away and we will do everything possible to deal with the hazard quickly and professionally.